PAMS (Parent Assessment Manual Software) 4.0 has been developed to present information within a format that interfaces well within the Framework for the Assessment of Children in Need and their Families (2000) and the Common Assessment Framework (DfES, 2006). 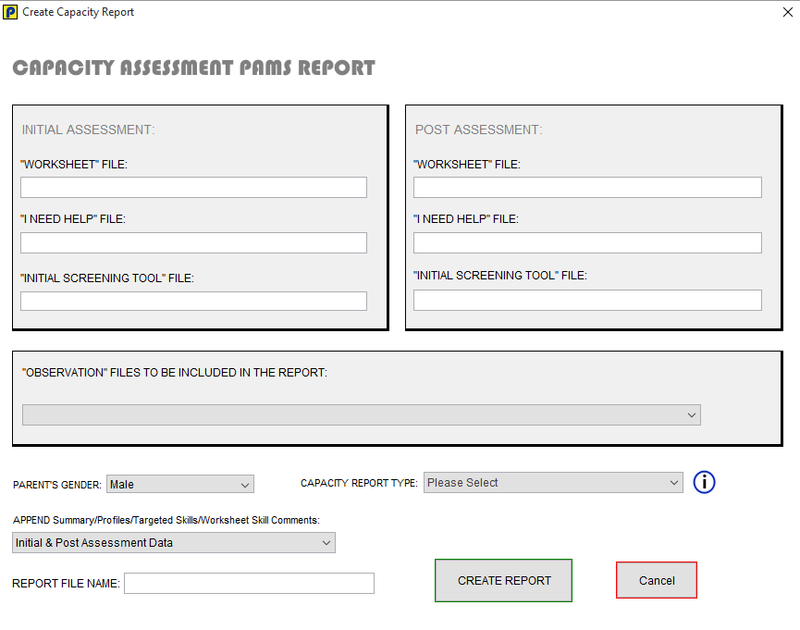 PAMS 4.0 simplifies the measurement of parental capacity and automatically consolidates the assessment data into template reports to assist the assessor with their report writing. PAMS began in 1998 as the Parent Assessment Manual. This was a spiral bound paper based assessment tool developed by Dr Sue McGaw. Due to its significant popularity, a software version (PAMS) was developed and released in 2004. A second edition (PAMS 2.0) was developed and released in 2007 and then in 2010 a third edition (PAMS 3.0) released. A significant content update (to incorporate the latest government parenting advice) was added to PAMS 3.0 and released in 2012/2014. PAMS 4.0 was released 16/05/2016. A significant content update (to incorporate the latest government parenting advice and new software functionality) was added to PAMS 4.0 and released in 2018. To date PAMS is being actively used by many Councils, Charities and Professionals across the UK and Ireland. 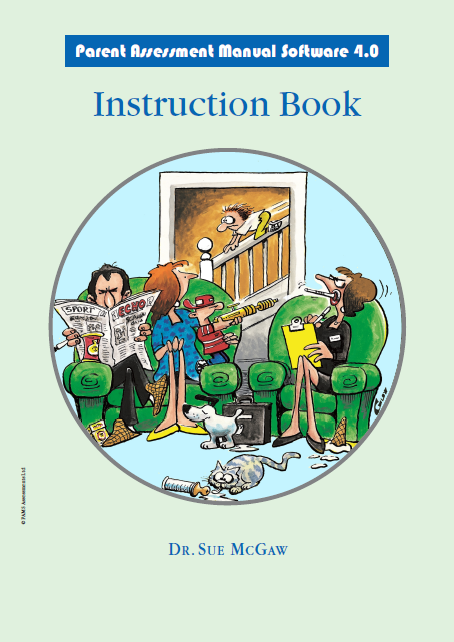 In addition to the PAMS 4.0 software, a spiral bound Instruction book, Knowledge book and Parent booklet are included with each pack (see below for more details). Most of the PAMS 4.0 (Parent Assessment Manual Software 4.0) components are detailed below. Almost every component in PAMS 4.0 can be printed from within the software. Please Note: As stated in the PAMS 3.0 "Instruction Book", training was highly recommended in the PAMS 3.0 but this has changed in the PAMS 4.0 to "PAMS training is needed for anyone who purchased the licence and intends to use the PAMS assessment with families". Anyone who is PAMS 3.0 trained should be able to use the PAMS 4.0 without further training. Ultimately, organisations, agencies and individuals hold the responsibility for ensuring that they are PAMS trained when they use PAMS materials. We are releasing both PAMS 4.0 Desktop and PAMS 4.0 Server Edition. The main software window interface has been updated for PAMS 4.0. Opened files can now be viewed and accessed quicker by clicking on the relevant file icon. Recently opened files can now be accessed from the 'File' menu. 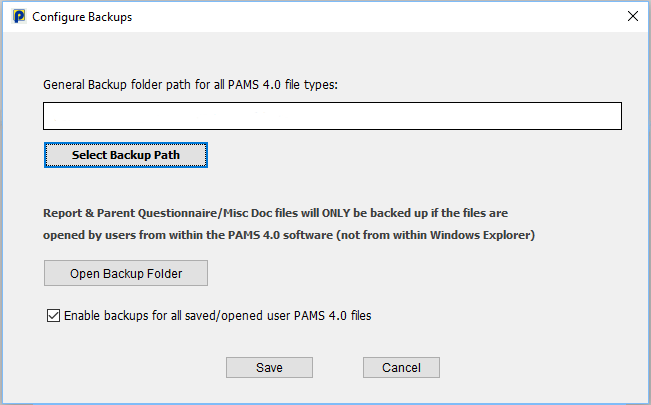 A brand new feature added in PAMS 4.0 is the "PAMS Case File". This captures all the files relating to an assessment (Worksheets, Observation files etc) , Case Notes, Linked Case files, Report Deadlines and all Reports created. 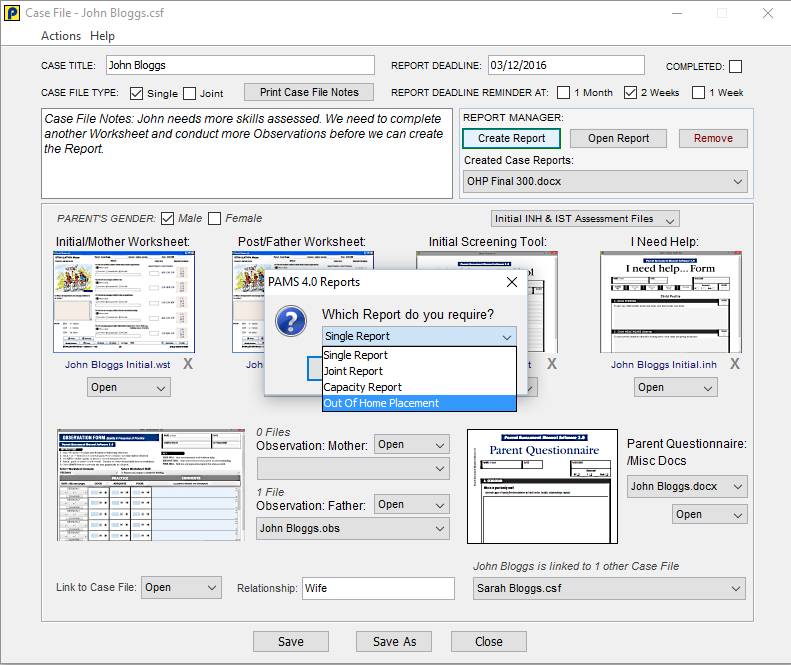 This will speed up assessments and report creation (all relating files are automatically added to the report window from the Case file). 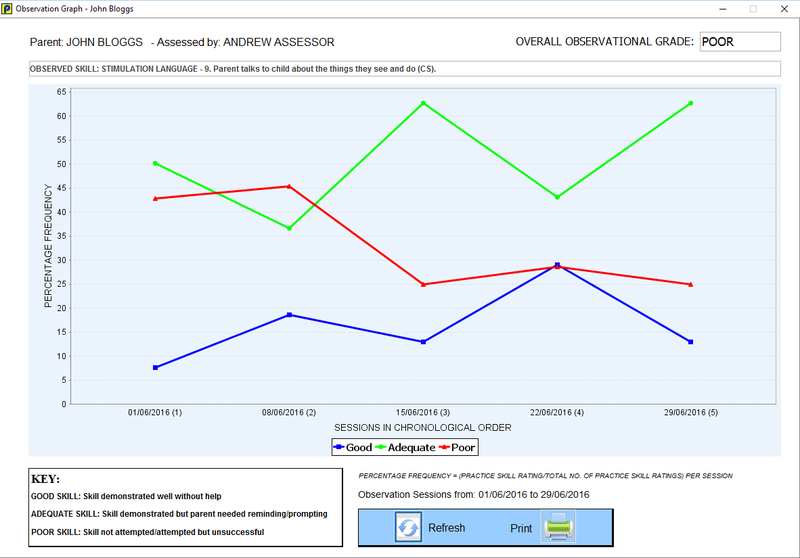 An unlimited number of Observation files can now be added to a Report. PAMS 4.0 has enhanced error detection, assisting the user in detecting errors more easily. Errors can now be automatically located on the Worksheets by the click of a "Go to Error" button (instead of manually locating them). PAMS 4.0 Instruction Book content has been revised and updated by Dr Sue McGaw. A spiral bound Instruction Book is included. This 76 page book is an excellent reference and guides the assessor on how to use and apply PAMS 4.0 during and after clinical assessments. 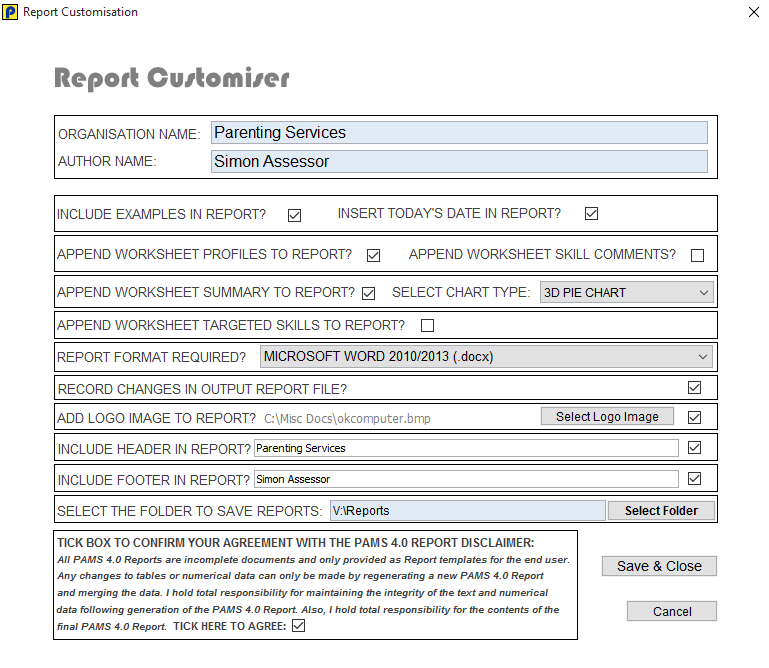 More Report customisation has been added to PAMS 4.0, allowing created Reports to be more personalised. A customised image logo and header and footer text are just some of the new features now included. 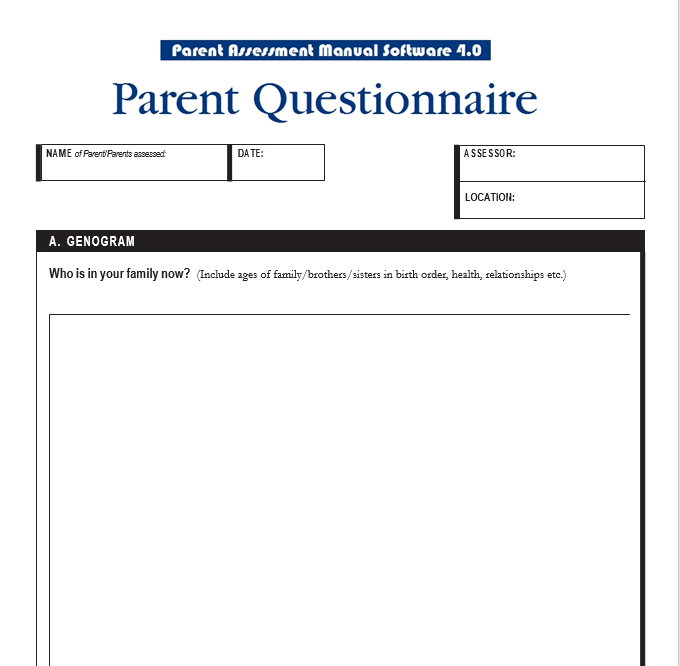 The Parent Questionnaire can now be edited and completed in digital format (Microsoft Word format) and also added to the PAMS Case File to be included with the other assessment files. 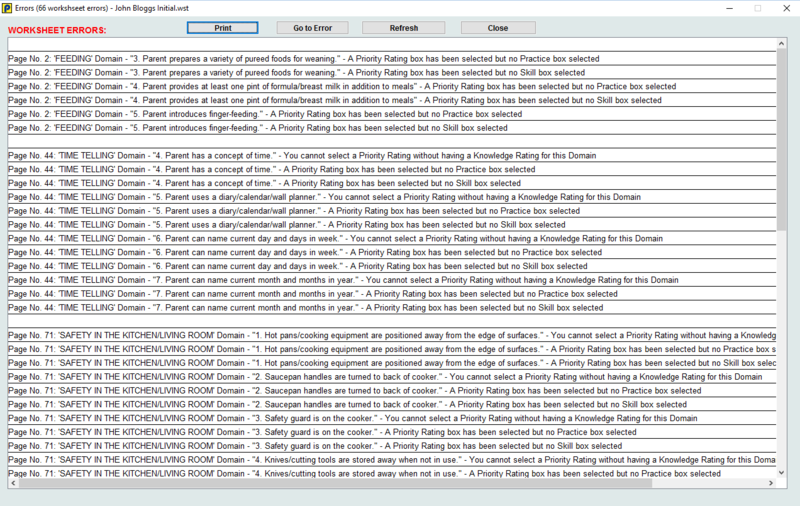 Users no longer need to locate and add all the relevant files when creating a PAMS Report. 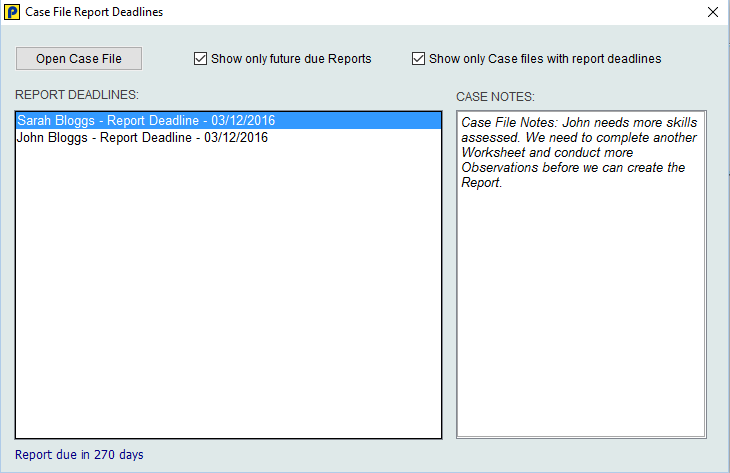 All files will automatically be added from the Case File, speeding up assessments and report creation. 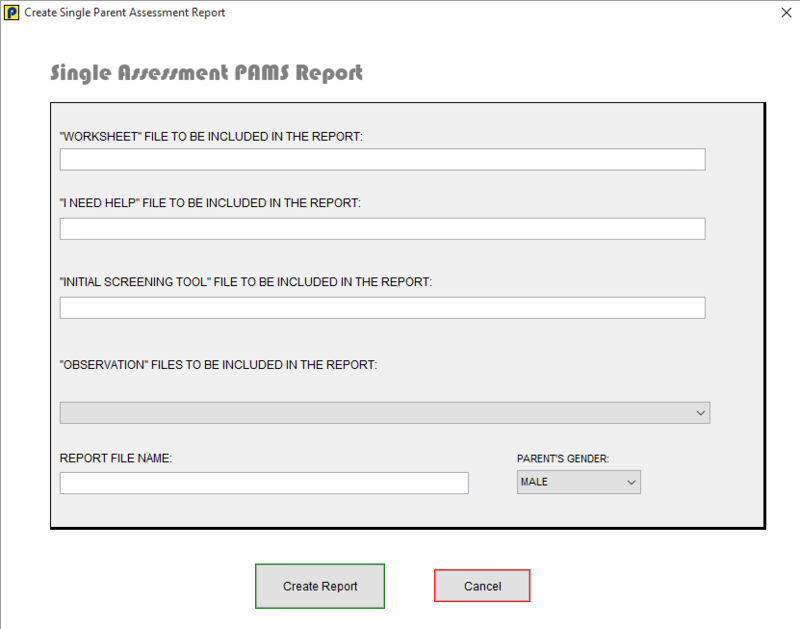 A Single Assessment Report processes and displays assessment data for one parent. The Report will include Data tables, a Report Summary, Worksheet Profiles, Worksheet Summaries, Observation Graphs and Targeted Worksheet Skills. 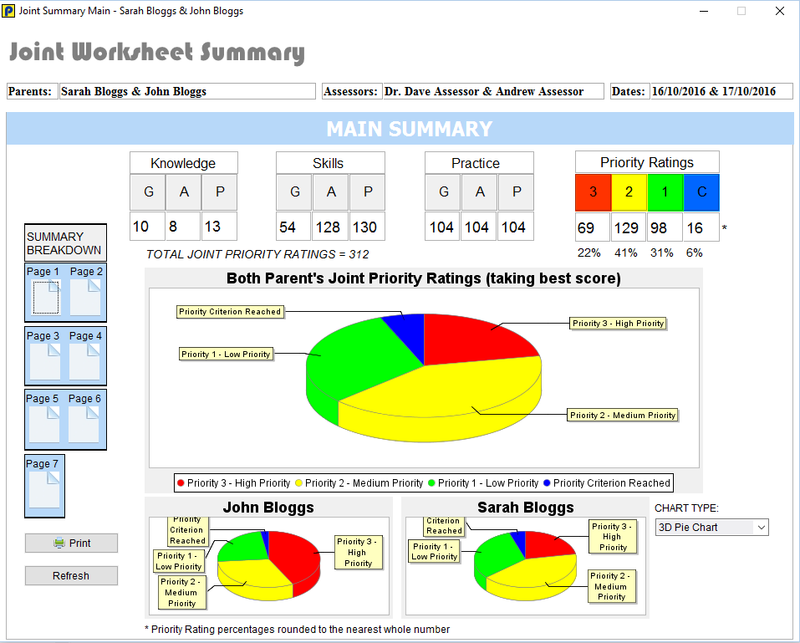 A Joint Assessment Report processes and displays assessment data for two parents. The Report will include Data tables, a Report Summary, Worksheet Profiles, Worksheet Summaries, Observation Graphs and Targeted Worksheet Skills. 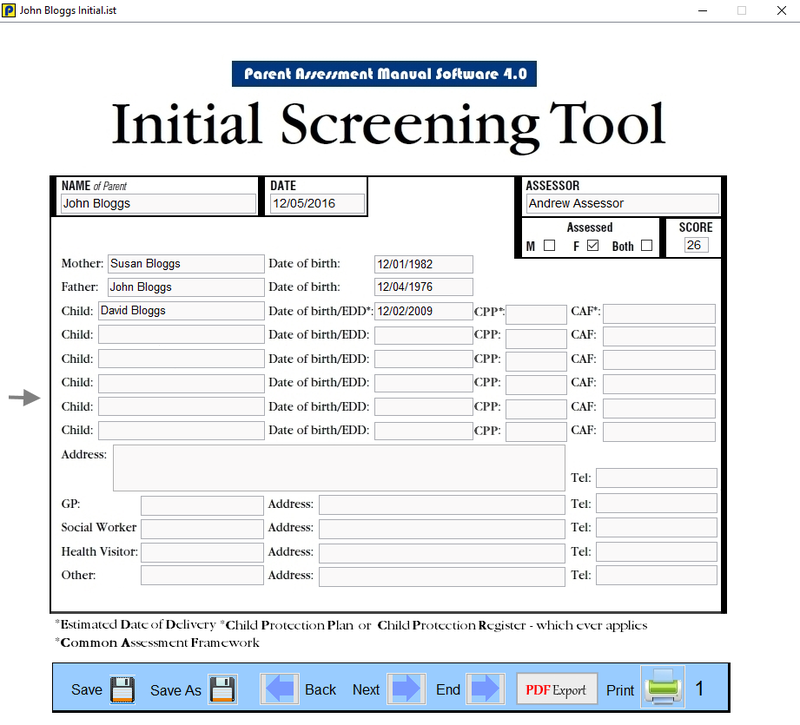 The PAMS software (Worksheets, I Need Help, Initial Screening Tool etc.) needs to be used by the Assessor for the results to be described as a PAMS Assessment. A PAMS Capacity, Teaching and Out of Home Placement assessment requires an Initial and Post assessment to be conducted, otherwise it renders the assessment invalid. 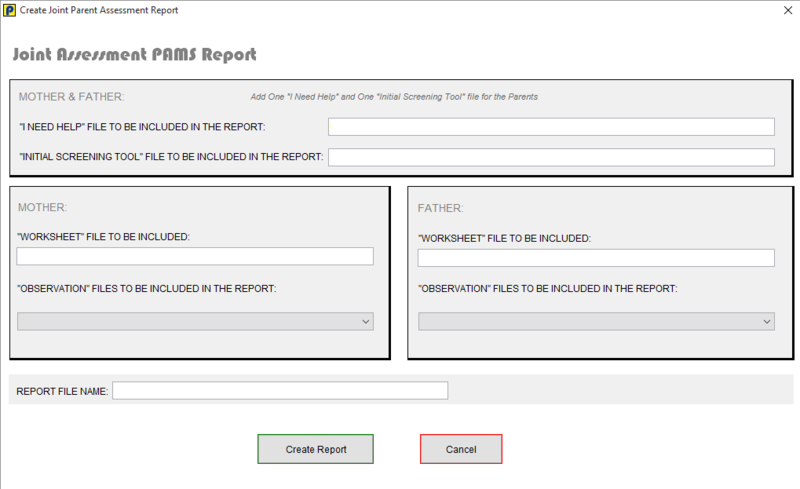 PAMS Capacity Reports capture information about a parent's progress over time. Two types of Capacity Report are available. These include the Capacity Update Report and the Capacity Teaching Report. The Report will include Data tables, a Report Summary, Worksheet Profiles, Worksheet Summaries, Observation Graphs and Targeted Worksheet Skills. 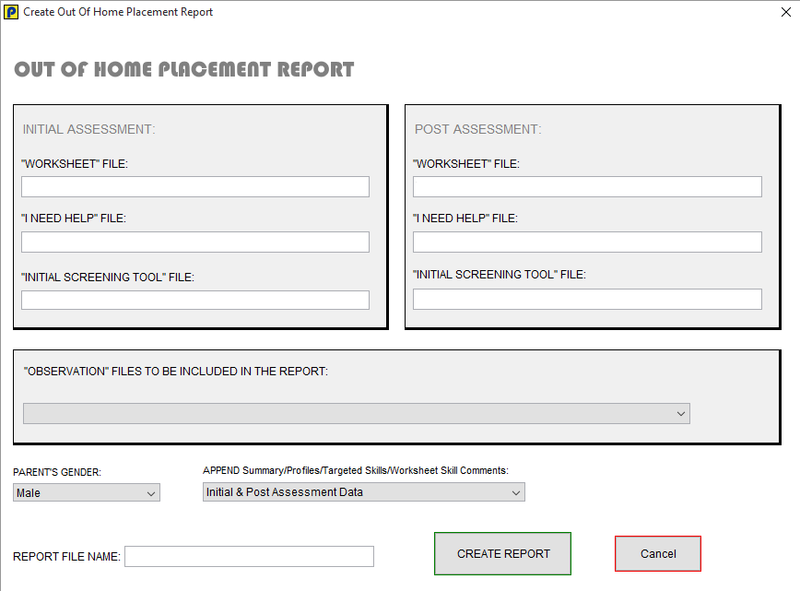 A brand new Report template for PAMS 4.0, the PAMS Out Of Home Placement Report (OHP) focuses on parents whose child/children are living outside of the family home pending a parenting assessment. This may be with or without their parent/parents. Using the PAMS tools the Main Assessor assesses the ability of one parent Post the OHP. Retrospective information about the day-to-day parenting is rated by a named Second Assessor for the Initial OHP period. PAMS 4.0 Worksheets have been updated. There are 94 Worksheets which need to be completed by professionals during the clinical assessment process. The PAMS 4.0 software will perform error checking on all data input into the worksheets to maintain integrity. Graphical Summary is produced after all worksheet data has been entered. Five different chart types can be selected. 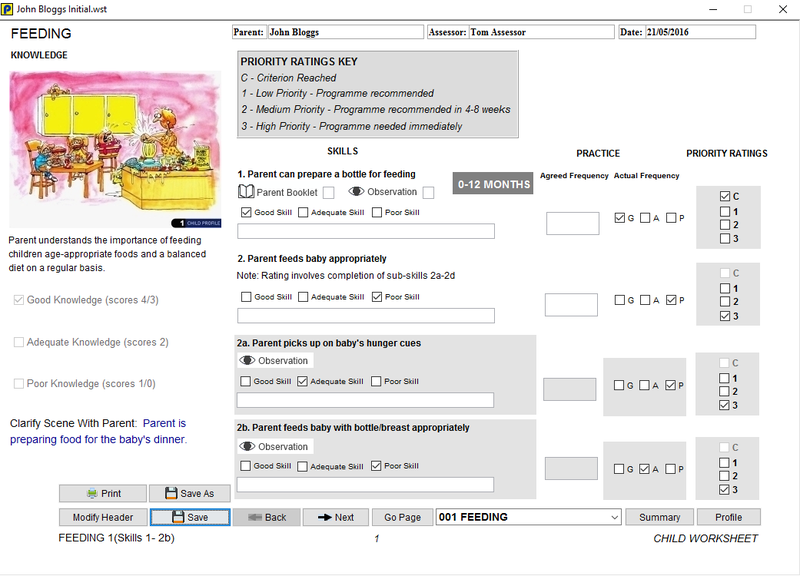 Single Summaries can be produced for each parent assessed. Joint Summaries combine the assessment of 2 parents (taking the best score of both) to produce a graphical summary as a couple. Graphical Profile is produced after all worksheet data has been entered. 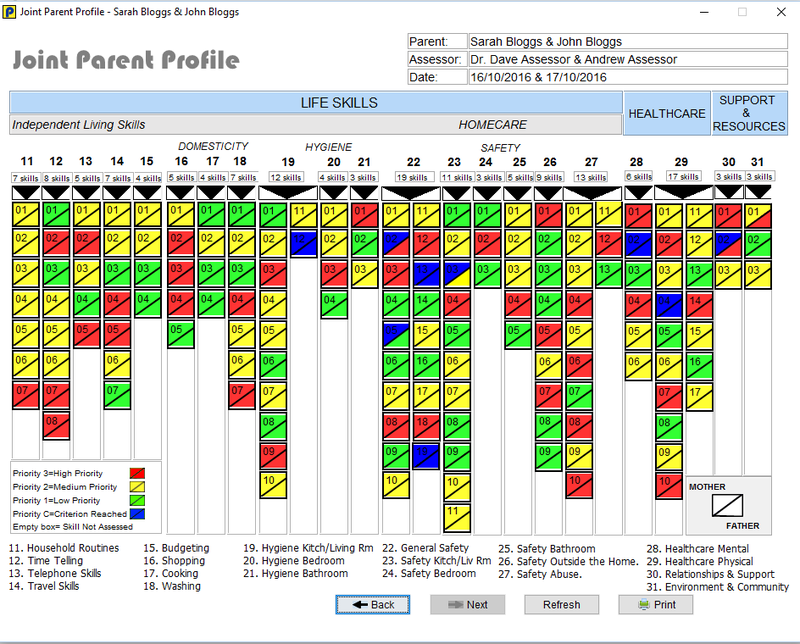 Single Profiles are produced for each parent assessed. Joint Profile combines the assessment of 2 parents to produce a graphical profile as a couple. PAMS 4.0 Parent Book content has been revised and updated by Dr Sue McGaw.This spiral bound Parent Booklet is to be completed by the parent. This booklet provides an alternative method for the assessment of skills that are difficult to observe. It is skill specific rather than exclusively knowledge based. 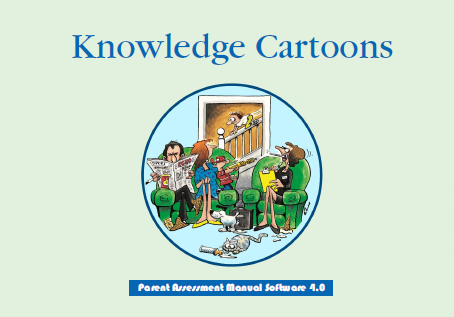 PAMS 4.0 Knowledge Cartoons have been updated with 4 new illustrations. The Initial Screening Tool (IST) is to be completed by the referrer or another professional who knows the family well. The assessment domains on the IST have been condensed into 15 sections, for ease of completion. IST scores are useful for making comparisons across families so that their needs can be prioritised. All of the PAMS 4.0 skills have been designed to be clearly observable. 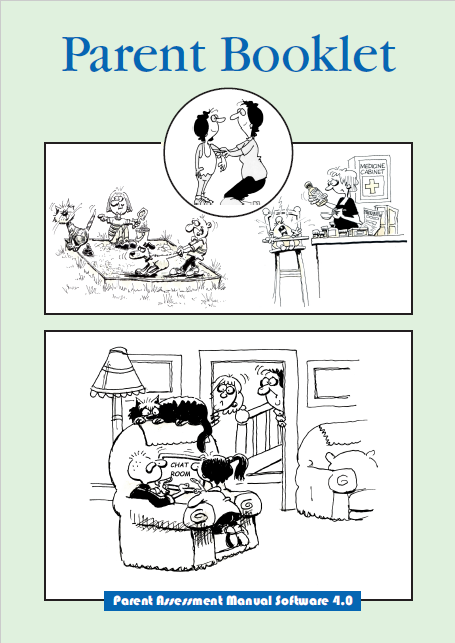 More complex parenting skills can be assessed in greater detail using the Observation Form. This data is then transferred on to the worksheets at the post-assessment stage. 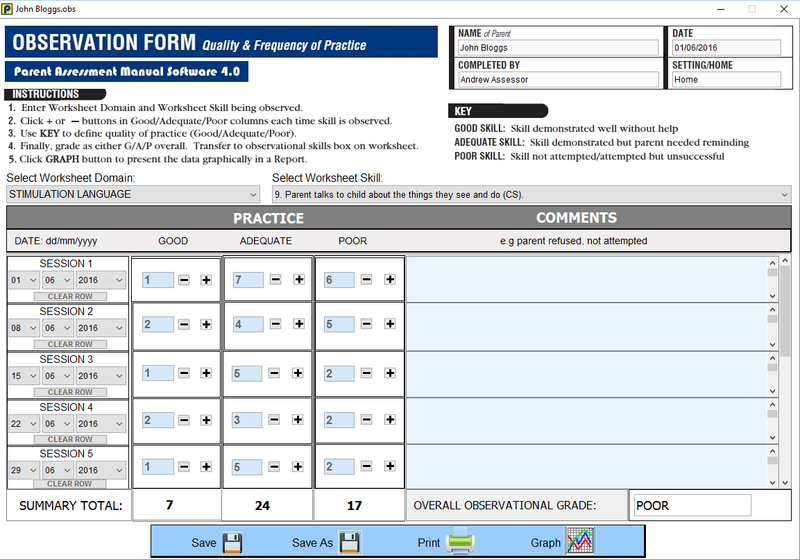 Observation data (from the Observation form above) is presented as a Graph at the click of a button.